GRAMMY-winner conductor and composer José Serebrier is one of most recorded classical artists in history. He has received thirty-seven GRAMMY nominations in recent years. All his recent recordings have received multiple GRAMMY nominations. When José Serebrier was 21 years old, Leopold Stokowski hailed him as "the greatest master of orchestral balance". After five years as Stokowski's Associate Conductor at New York's Carnegie Hall, Serebrier accepted an invitation from George Szell to become the Composer in Residence of the Cleveland Orchestra for Szell’s last two seasons. Szell discovered Serebrier when he won the Ford Foundation American Conductors Competition (together with James Levine). Serebrier was music director of America's oldest music festival, in Worcester, Massachusetts, until he organized Festival Miami, and served as its artistic director for many years. In that capacity, Serebrier commissioned many composers, including Elliot Carter's String Quartet No. 4, and conducted many American and world premieres. Serebrier has made international tours with the Juilliard Orchestra, Pittsburgh Symphony, Philharmonia Orchestra, Royal Philharmonic Orchestra, Scottish Chamber Orchestra, Toulouse Chamber Orchestra, National Youth Orchestra of Spain and others. Serebrier's first recording, the Ives' 4th Symphony with the London Philharmonic Orchestra, won a Grammy nomination. His recording of the Mendelssohn symphonies won the UK Music Retailers Association Award for Best Orchestral Recording, and his series of Shostakovich's Film Suites won the Deutsche Schallplatten Award for Best Orchestral Recording. Soundstage magazine selected Serebrier's recording of Scheherazade with the LPO as the Best Audiophile Recording. He has recorded with the London Symphony Orchestra, London Philharmonic, Royal Philharmonic, Philharmonia, Bournemouth Symphony, Oslo Philharmonic, Bamberg Symphony, Royal Scottish National Orchestra, Royal Liverpool Philharmonic, Scottish Chamber Orchestra, English Chamber Orchestra, Barcelona Symphony, Czech State Philharmonic Brno, Weimar Staatskapelle, Sydney, Melbourne and Adelaide symphony orchestras and many others. "Serebrier Conducts Prokofiev, Beethoven and Tchaikowsky" filmed at the Sydney Opera, has been shown over 50 times on U.S. television. 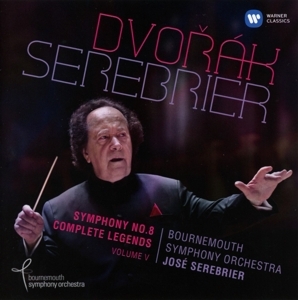 Serebrier conducted at the 2004 GRAMMY Awards ceremony in Los Angeles, telecast live to 175 countries. Serebrier presently records for Naxos, BIS, Warner Classics, RPO Records and Sony/BMG. As composer, Serebrier has won most of the important awards in the United States, including two Guggenheims (as the youngest in that Foundation's history, at age 19), Rockefeller Foundation grants, commissions from the National Endowment for the Arts, the Harvard Musical Association, the B.M.I. Award, Koussevitzky Foundation Award, etc. Born in Uruguay of Russian and Polish parents, Serebrier has composed more than 100 works, published by Peer Music, Universal Edition Vienna, Kalmus, Warner Music, and Peters Corp. His First Symphony was premiered by Leopold Stokowski (who premiered several of his works) when Serebrier was 17, as a last-minute replacement for then then still unplayable Ives 4th Symphony. His music has been recorded by conductors such as John Eliot Gardiner, among others. Serebrier made his US conducting debut at 19 with the National Symphony Orchestra in Washington, performing his Symphony No. 2, “Partita”. His new 3rd Symphony, "Symphonie Mystique" received a GRAMMY nomination for "Best New Composition of 2004". It was premiered at Carnegie Hall, NY in 2005. His "Carmen Symphony" CD, with the Barcelona Symphony Orchestra, won the Latin GRAMMY for "Best Classical Album of 2004". The French music critic Michel Faure has written a new book about José Serebrier, published last year in France by L'Harmattan. Serebrier's first recording with the New York Philharmonic, on Warner Classics, was released recently, and his new recording with the London Symphony Orchestra, for Sonny Classical was also recently released.